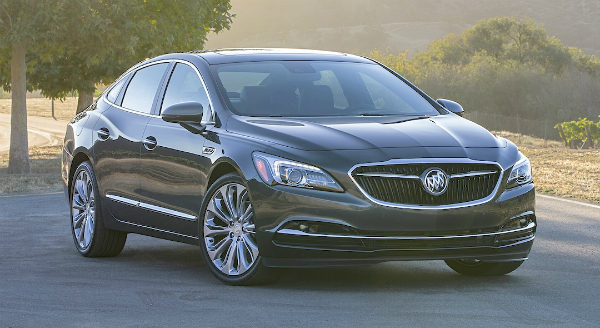 2017 BUICK LACROSSE by Jim Corbran, Automotive Columnist I’ve always thought that Buick had some nice-looking mid-sized cars — right up until they introduced the LaCrosse for 2005. It should easily go down in history as one of the most boring-looking things on the road. A total redo for MY 2010 took it out of the boring category and put it at the top of the Worst-Dressed List. Who wears hip pads? Another redo, for MY 2017, was recently unveiled at the Los Angeles Auto Show. From what I’ve seen this time Buick may be back in the style game. A much more svelte beltline — minus the hip pads — give it a more modern, almost — pardon me for saying this, but — hip look (see what I did there?). It is, as Buick tells us, based on the Buick Avenir concept car, as seen at the 2015 Detroit Auto Show, which in turn, Buick tells us, was inspired by the 1954 Wildcat II concept (see below). That to me is either a real stretch, or Buick trying to earn some points by invoking the name of a popular old show car. The grille on the new LaCrosse officially introduces the new face of Buick, which will eventually be worn by the whole Buick line. And besides the style changes, the LaCrosse will be built on a whole new chassis, stronger yet lighter than the current model’s, which Buick tells us will provide a more dynamic driving experience. I’m looking forward to seeing it in person. See more here: 2017 Buick Lacrosse ### The post 2017 BUICK LACROSSE appeared first on Buffalo Cars.